﻿I celebrated the tenth anniversary of my twenty-ninth birthday this month. (Ha!) My husband and children sure made my birthday a special one this year. They'd been asking for weeks what I wanted to do this year to celebrate. I was gifted with roses, perfume and my favorite bottle of Prosecco (can I get an amen ) on the morning of my actual birthday. But, they wanted to take me out to do something fun, too. Get me outta this town ... let's do some shopping and get some good grub. We live in a very small county in Michigan. We're about an hour and fifteen minutes away from one of my favorite places to visit in Michigan - Ann Arbor. It is such a lovely, fun place. When we're there, I hit up some of my favorites stores - Trader Joe's, Whole Foods, Lush, World Market and a few others. Ann Arbor is, also, home to the best place I know to find one of my favorite foods on the planet - falafels (fried chickpea fritters). They've, also, got a Williams-Sonoma (did you see my recent post about my very first visit there when I was shopping out of state a couple of weeks ago? ), so a return visit was on the definitely on the agenda. I'm a city girl at heart, but have lived in a small, rural area for the last twelve years. There aren't many shopping, dining or entertainment options locally for us, so we so enjoy getting outside of our area for a day out on the town. So, the day before Easter, they took me to Ann Arbor. Wherever I wanted to go, we went. I hit up all of my favorite places there and picked up lots of great items (hello, new blog serving dishes and props). The weather was beautiful and we had a fabulous family day together. I love Lush. So intoxicating and their soaps are almost works of art. Soaps galore at World Market. The peach one is my new fave! Spotted at World Market. Sounds legit. I could spends hours in this place. Hanging jar display at Williams-Sonoma. I might have snatched up one or three new kitchen gadgets. I was, also, lucky this year to have my birthday fall on Easter weekend. It was nice having the hubby and kids home for a few days. We spent Easter Sunday with my side of the family for a nice dinner, an egg hunt for the kiddos and great fellowship. My sister, brother, mother and I celebrating Easter together with our families. To cap things off, my husband took me away the following week to continue celebrating at Soaring Eagle Casino and Resort. We enjoyed some time playing the slots and having a few drinks. It was much-needed time away from daily life for the two of us. We don't often get away together or even go out on many date nights, so this was a real treat for us. Steve and I heading out for our evening away. P.S. I already found the present I'd like for my next birthday - these chairs (but, in black). And, not only do they look fabulous, they are super comfortable. Casino diner chairs. I so want these. Happy belated birthday, Angela! Sounds like a pretty perfect weekend to me. I also just love Ann Arbor and go back there every chance I get. It's funny, because I lived there for four years in college, but I didn't have a car, so there was so much I never got to see. I've explored so many new places in AA now that I'm older! 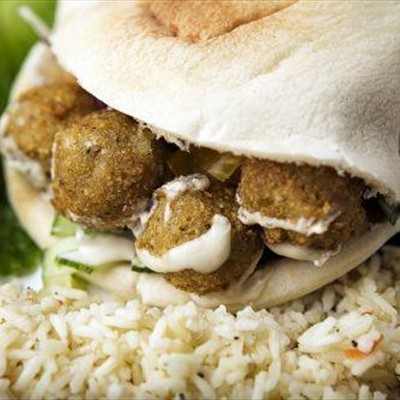 I'm going to have to investigate that falafel place, because I LOVE me some falafel. I think I'm always "team hat" on guys when I see anything other than a baseball hat. Must be my longing for the days when everybody actually got dressed up nicely every day, and men wore suits and hats. Or, I'm obsessed with Mad Men. Either way. Just came across your blog while searching for overnight oats recipes. Your's looks amazing btw. I live in Chesaning, Michigan and Ann Arbor is one of my favorite places to go when we have a free weekend to get away. The casino is also not far to go for a good time. You must not be too far from this area also. What a small small world. Getting a lifestyle blog up and going is currently on my list of things to do so I may be reaching out to you again in the near future for some tips if you are willing to share any.